By Matt Goodman | 4 years ago Widely admired for his focus, his foresight, and his commitment to patients, the hospital chief is our 2014 honoree. By Dr. Miguel A. QuiÑones and Dr. Robert W. Rasberry | 4 years ago According to the latest SMU Cox poll, DFW business leaders are anticipating continued improvement in the local and U.S. economies. By Joseph Guinto | 4 years ago How did its co-founders make it one of the fastest-growing private companies in america? By not thinking like an energy provider. 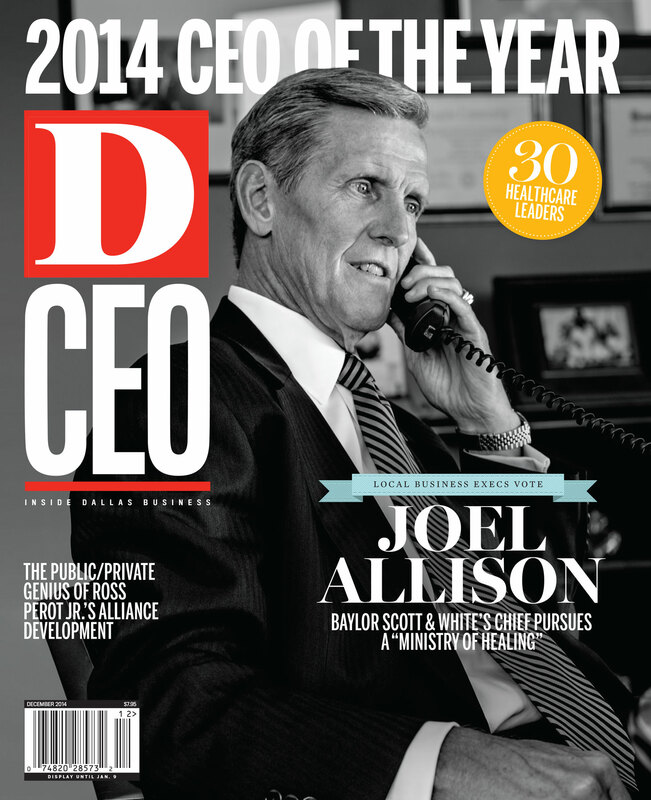 By Jeff Bounds, Matt Goodman, and Glenda Vosburgh | 4 years ago D CEO recognizes the individuals—and the institutions—standing head and shoulders above their peers in 2014. By Hilary Lau | 4 years ago These outstanding executives were recognized by their peers for their leadership. What’s in a Name For Texas Law Firms? By John G. Browning | 4 years ago When it comes to their non-lawyer executives, apparently a lot. By Karen Nielsen | 4 years ago The senior vice president, Regional Executive U.S. Trust, Bank of America Private Wealth Management, is one of the area's youngest market leaders. By Tanya Rutledge | 4 years ago Marketing to both “the classes and the masses,” he's made his wholesale company an industry leader in North Texas. By Michael J. Mooney | 4 years ago The owner and head chef of Parigi on how the Dallas dining community is like a small town. By Hilary Lau | 4 years ago Life at home is becoming more high-tech than ever. By Holly Haber | 4 years ago Its Highland Park Village space closed last summer, but the exclusive shop reopened in Preston Center. By Tanya Rutledge | 4 years ago Rise aims to disrupt the market with a “common-sense” business model. By Jenna Peck | 4 years ago The president and CEO of Fusion Logistics on the business lessons he's learned. By Hilary Lau | 4 years ago Playing in a tribute band sustains this financial guru's rock dreams. By Christine Perez | 4 years ago For all its size, it's a pleasure to drive. By Phil Harvey | 4 years ago Stadiums are moving into the hyper-connected age with a new breed of novel, networked experiences. By Steve Kaskovich | 4 years ago Ross Perot Jr.’s sprawling development in North Fort Worth has flourished.